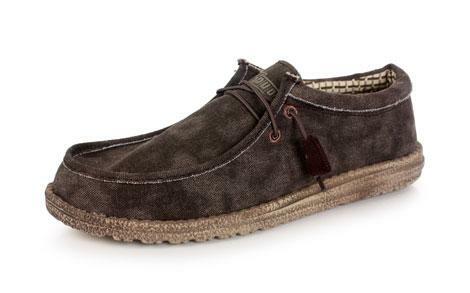 Wally is the super lightweight loafer from Hey Dude of Florence Italy. This classic loafer is lined with oxford cloth to enhance a sturdy canvas exterior. Contrast stitching and padded top-line add a worn in, slipper vibe, while the distressed-style supportive rubber sole brings structure to the relaxed look. The Hey Dude Wally comes fitted with elastic laces for easy comfort and an additional set of hard laces for those occasions when something more secure is desired. And when your Hey Dude Wallys get a bit trail weary you can pop them in the washing machine on a cold cycle to freshen them up.